Where will this rank if we win? I know many will shoot me down for suggesting this could equal 98 or 5-1, but almost 5 years after being minutes from liquidation, would it be one of our finest hours if our boys bring the cup home? It will be behind 5-1 and 98’ but ahead of 2006. Yes. Best ever in my opinion. On par with 5-1 for me. Still wouldn’t beat ‘98 though. For me I think the overall significance will be diluted by how divided out support is over a number of things not least the manager. Given our near liquidation, relegation and promotion, to win a cup so soon should be an amazing achievement made sweeter by ending Celtics treble treble. Sadly I think our fans will find ways to downplay the significance. Not on the day in the stadium I hasten to add but when analysing the significance. Ann Budge said she wanted us back challenging for trophies, we are now yet i don’t get a sense people are actually that delighted about it. 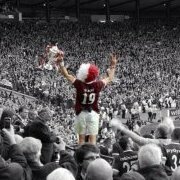 Behind 2012 (That is THE ultimate peak for me) but up there with one of my best days as a Jambo. I was too young to properly remember 98’. 98 will always be the greatest day. But it would be up there and very close. If we win it will be a stunning victory and totally unexpected. Our performances have been poor and while we are in the final our route has been relatively easy. While our route to the final was easy in 98 our performances were of a significantly higher standard. The semi final win against Celtic was probably the best celebration I have ever been involved in. 1998 was amazing. 2012 was great (but never really in doubt). 2006 was good. 2019 would probably be the best yet for me, simply because I absolutely hate Celtic. All the late winners they've scored against us, 1986, 1988, their constant cheating, their scummy fans, Scott Brown. We just seem to have suffered most against them than any other team. To burst their treble dreams...well, I'd probably self combust. It would rate the same as every other game we will play in my lifetime......below 1998! I’m not bothered where it’ll rank, tbh. I just want us to win. To get to 9 Scottish Cups would look good on the honours list. Just 1 away from double figures wins in a national comp. On par with 2012 for me. Wasn’t old enough to remember 1998. To beat a strong Celtic team, in comparison to ours, and to end their treble treble would be unforgettable. Every one is fantastic. This would be an absolute belter. For the fans who were there, the emotion of 98 probably will never be topped but football wise I believe this certainly the biggest underdog situation Hearts have been in. 2006 and 2012 we were the favourites to win the finals and we did so, 5-1 obviously is immortal. But this one, Celtic spend 10x what we do on players what a joy it would be to beat those ***** in a final especially for Levein to get himself a medal. Totally agree. Hearts were overwhelming favourites in 2006 & 2012. 1998 was different , bur Hearts were very much a team on the up and Rangers were being broken up. It would be a massive shock if Hearts were to win this year. It would equal 98 for me. When the final whistle blew in 98, the feeling cannot be replicated and thinking about it still puts a lump in my throat. We had a Hearts legend in charge that day in JJ and wee Robbo lifting the cup with hand on heart is one of the iconic Hearts images. Let's also not forget that we played a fantastic Rangers team that day. 2006 and 2012 were a formality and never in doubt. Winning the cup this year, 5 years after the club were very nearly liquidated, would underline the incredible progress that the club has made since and the outstanding job that Ann Budge and Craig Levein have done. It's nothing short of a miracle that we're here but that's just how dedicated and talented everyone at the club is to making Hearts the top of the pile in Scotland. This is just the beginning though, once Levein gets one trophy, they'll come in droves so get used to it folks. Nobody is more deserving of a cup win than Oor Craigy. I'm not trying to downplay it at all and I'm delighted we're there, but I think that has a lot to do with the draws we had. Can only beat what's in front of you but we've had livi - auchinleck - Partick - Inverness. Would've taken abject failure not to reach the final. We were due a run like this though, our luck in cup draws has been horrendous up til this season. 1998 run was Clydebank, Albion Rovers, Ayr Utd and Falkirk ! On JKB perhaps, I would agree, but it will end some posters for the summer and others will recreate themselves. But lets not have that bother us. The part I have highlighted are my thoughts. It will be the greatest I think I have ever seen. Even better than 98. I said to a wee man next to me on 19th May 2012, enjoy this, it could be a very long time before we see it again. 7 short years on, and just 5 since coming out of admin, with our ground fully redeveloped, what a wonderful reward this would be. The league form has been less than what we hope for or expect, but on 25th May, it wont matter a jot. There are some very good players in our team, they need to put it together for one day and deliver a performance. It might still not be enough, Celtic are obviously the strongest team in Scotland by a long way, but who knows. Its a one off and pressure can tell, there will be so much expectancy in Celtic, if we can unsettle them, that can be hard to handle. Its our hardest task in all of the Cup Finals I have seen since 86, given the decade that it has been, this would be an incredible rags to riches story and real reward for the thousands who saved the club and helped fund it. The thought of ending the treble treble and to see the disappointment on Neil Lennon’s face is orgasmic. 1998 was incredible to witness. I’ve never felt so emotional after a game. It would beat the 2006 final easily and overtake the pump fest of 2012. I think in regards to an achievement it will top the lot but it would not beat the feeling of being 5-1 up against hibs at Hampden. a 4-0 win to match the win that ended their unbeaten run, a 4-0 win to end their treble treble, Lenny last game as Celtic manager.. HMFC burned into that pricks mind for the rest of eternity.. I was there in 1956 as a 9 year old, I was at every disappointment until 1998. To me that was a truly glorious day, even the weather. My daughter's birthday as well. I was there with her in 2006. I was ill in 2012 but just about killed myself when the first goal went in. If we win on 25th May, it will actually be the greatest achievement of them all, because of the massive gulf and stopping that lot and their treble treble. However, '98 emotionally for me remains top of the list. Great stuff Colin. Now if you wouldn't mind having a quick word with the man above about the final, that would be appreciated! I think as colin says, given the gulf this would be our greatest achievement. So many reasons for us not to win but how good would it be to see Lennon cry?? For me, behind both 1998 & 2012 but ahead of 2006. 1998 - This was us breaking a trophy drought going back decades. 2012 - Do I even need to put why this one is so special? Spot on, 98 trumps everything for me as well. I would put it above 2012 if we win. It will be better than 98 and 2012 put together. The rest of the country- or at least everyone who does not support a green and white team, will be rooting for us too.. It would be a massive result. Just had a phone call from my daughter who has progressive MS and is in a wheelchair, as she was in 2006. We were high up above the Hearts end then and it was ideal. "Dad, will you take me to the game?" Talk about the blind leading the blind!!! Not sure if we'll get tickets? Any advice? Behind the 5-1 game but on par with 1998. Usually agree with most of your stuff Marvin, but can’t agree with this post. Anyone think that the folk who are putting the potential 2019 cup win ahead of ‘98 and the 5-1, are doing so purely because of who this years opposition is? Yip. That’s it in most cases. Nothing will beat the 5-1, short of getting them again and beating them 8-1 ! I can understand votes for 98’ from folks of our generation because of the previous failings but 2012 can’t be topped. Too young to appreciate what really happened in 98. 2012 was so easy it didn't seem real.